It's Super Bowl Party time! 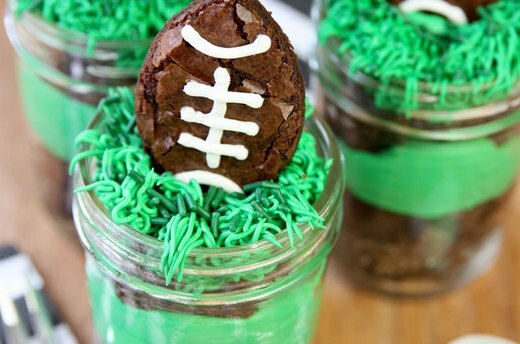 Enjoy the big game with this mason jar brownie sundae! 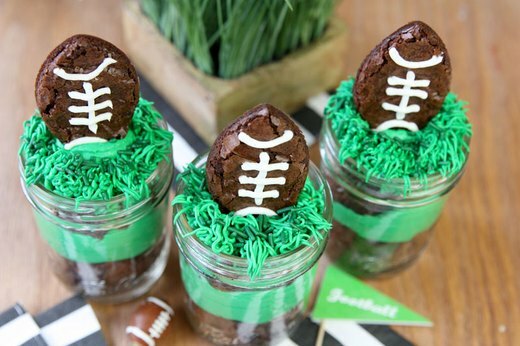 Brownies in the shape of footballs top layers of luscious buttercream and fudge brownies for a tasty, football treat! 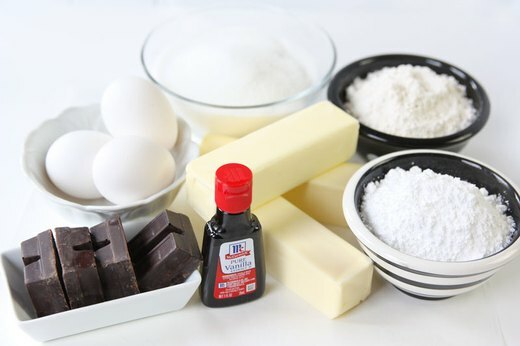 Whip up two batches of your favorite brownies (or opt for semi-homemade with your favorite brownie mix) and a big batch of vanilla buttercream frosting. Reserve a small bowl of the white buttercream for the football laces, and tint the rest a grass green! 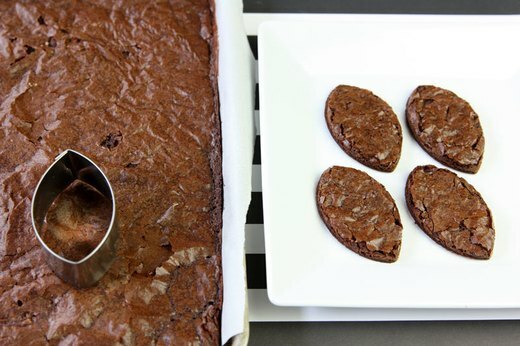 Let both your brownie pans cool before cutting. One pan will become the mini squares for layering and one pan will become the mini footballs. 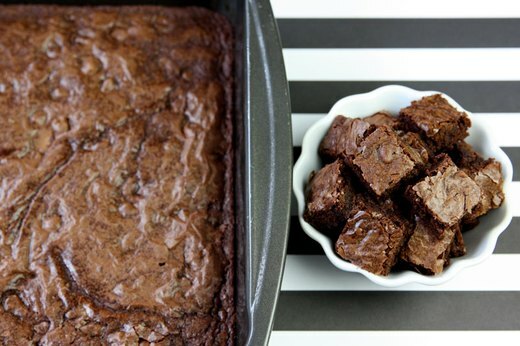 To start, chop one pan of brownies into 1/2" squares. These will be layered in the mason jars. 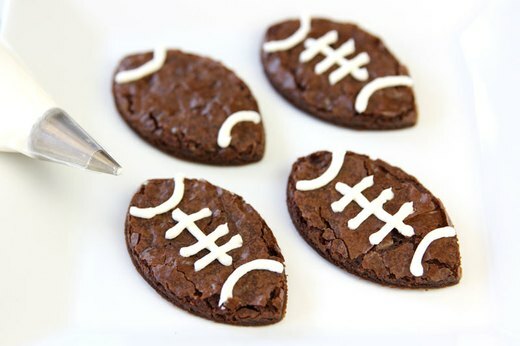 Next, using a football cookie cutter (or oval shaped cutter), create mini football-shaped brownies. 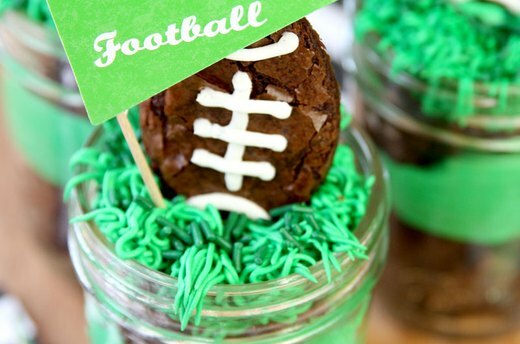 Make one football to top each mason jar treat. 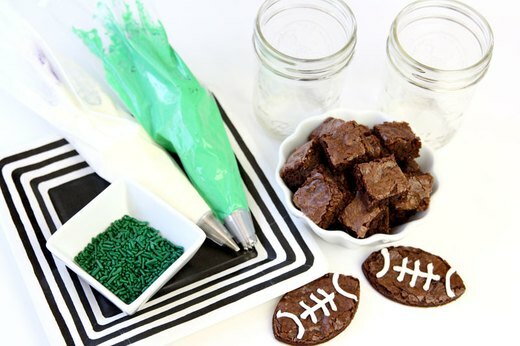 Give the football-shaped brownies their final touch by piping vanilla buttercream laces onto the brownies. Use a small round piping tip and piping bag to create the white lace lines. Time to put it all together. Start with a layer of your brownie squares. Next, add a layer of buttercream tinted green for "grass." Repeat layers until full. To complete this recipe, use a "grass" tip by Wilton to pipe buttercream on top of the brownie layer. Sprinkle with green jimmies for an extra touch of color. 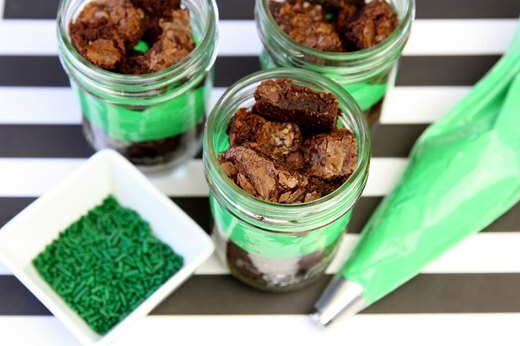 Complete your mason jar treat by setting a football brownie into the buttercream "grass." And feel free to add your own twist to these: sprinkle with chopped nuts, use ice cream instead of frosting, or choose your team's colors for extra fan spirit! Serve with a mini fork during the big game or display on a halftime dessert bar. These sweets are certainly a fantasy for any football fan!